Accessible to enthusiasts, students and professionals of all skill levels, every issue features the biggest agency profiles, behind the scenes look at how the best sites are built and cutting-edge trends and techniques. 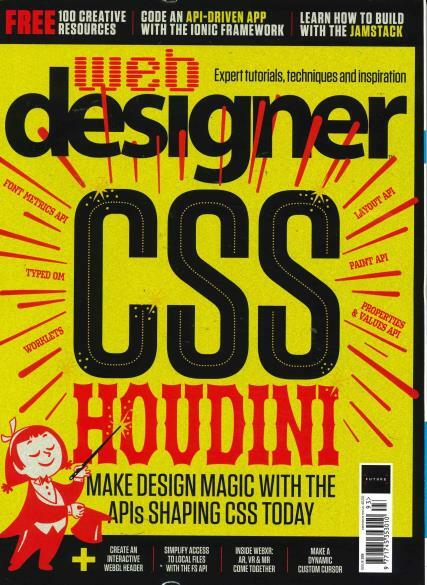 Every issue delivers extensive features on the latest must-know technologies and tools, plus a wealth of step-by-step tutorials that provide the techniques needed to succeed in today’s creative web industry. PLUS: as a subscriber to Web Designer, you have access to over 3,000 creative resources via FileSilo - all for free! You’ll find brushes, textures, backgrounds, icon packs, CSS / HTML templates, fonts, stock images, video tutorials and more. Web Designer’s FileSilo is a rapidly growing library that’s updated continually with cool resources. Secure online access makes it easy to keep your downloads organised, plus you can browse and access the content from anywhere, whether you’re a print or digital subscriber. Comprehensive features: Whatever the latest trends are Web Designer will offer an in-depth and practical view on how to best the best from them. Pro tips & advice: The industry gives it expert opinion on the issues that web designers and developers need to know.